Mitt Romney gave up on winning support from nearly half of the American electorate in May, telling wealthy supporters at a private fundraiser that he could not hope to win the votes of the 47 percent of Americans who, he said, do not pay federal income taxes. So who are these 47 percent of Americans that Romney is not going to “worry” about winning over? In 2011 those 76 million people, about 46 percent of the people who filed taxes, did not pay a penny in income taxes, according to an analysis of IRS data by the bipartisan Tax Policy Center. But that does not mean nearly half of America skirted their federal tax burden. Nearly two-thirds of the households that did not pay income tax in 2011 were on the hook for payroll taxes, a 4.2 percent tax that is automatically deducted from workers’ paychecks to fund Social Security and Medicare. Only 18 percent of tax filers did not have to pay either income tax or payroll taxes. Nearly all of the people who did not pay either type of tax were elderly – 10.3 percent of total tax filers – or had incomes less than $20,000 – 6.9 percent. But it’s not just low-income people who get out of paying income taxes. About 1 percent of the top 1 percent of income earners, those making about $533,000 or more, did not pay income taxes. That’s roughly 13,000 tax filers. And 4,000 millionaires are also escaping that burden, according to a Tax Policy Center analysis. The majority of people who pay zero income tax, though, are low-income families. Last year 99 percent of people earning less than $10,000 per year paid no income tax. Roughly 78 percent of the households that did not pay income tax were below the poverty line. Many of these low-income earners may not even realize they do not pay income tax. According to an April Gallup poll, 50 percent of people who earn less than $30,000 per year said the amount they pay in income taxes is too high. More than 80 percent of those people do not pay a dime of income tax. They are on the hook, though, for a host of other taxes such as sales taxes, property taxes, state income taxes and excise taxes on items like alcohol, gasoline and cigarettes. Besides these income-tax-free voters, Romney also conceded to Obama voters who are “dependent on the government” for things like health care, food and housing. About 38 percent of Americans rely on the government for their health care, according to the Center for Medicare and Medicaid Services. Whether they are low-income and get their care through Medicaid (54 million people), are elderly and receive insurance through Medicare (46 million people), are low-income children and are covered under the Children’s Health Insurance Program (5.5 million kids), or are current or former members of the military and receive health care through the Departments of Defense or Veterans Affairs (12.5 million people), more than 109 million Americans get their health insurance through government programs. “I was backstage with him and he was laughing,” Romney strategist Stuart Stevens told reporters today. Eastwood’s performance at the Republican National Convention, in which he pretended to speak to President Obama as though he was sitting next to him, has been the topic of the day. Ann Romney called Eastwood’s delivery “unique,” but the routine has been mocked on Twitter. Eastwood sparked a parody Twitter account, @invisibleObama, which drew thousands of followers immediately after the incident — but now it seems to have disappeared. Another Twitter account, @ClintsChair, has about 2,300 followers. “TGIF: Have you yelled at your chair today?” says one tweet. Stevens said the crowd inside the Tampa Bay Times Forum “loved” Eastwood’s routine. Lost in all of today’s chatter, he said, is the substance of Eastwood’s support for Romney as president. “You could see in this he hit points that he’d hit before in the funders and were good points. He just chose this narrative way to deliver it,” Stevens said. Mitt was born in Detroit on March 12, 1947. His mother, Lenore, gave up an acting career when she met and married his father, George. Mitt’s father came from humble origins and never graduated from college. He apprenticed as a lath and plaster carpenter and sold aluminum paint before beginning a career that brought him to the head of American Motors and then the governorship of Michigan. Mitt married his wife, Ann, in 1969. They first met in elementary school when he was a Cub Scout; he remembers tossing pebbles at her when she rode by on a horse. When they met again years later at a friend’s house, he was smitten. Between them, they have five sons and eighteen grandchildren, who are the center of their lives. Mitt is not a career politician. He has spent most of his life in the private sector, giving him intimate knowledge of how our economy works. But he has also been an outstanding public servant. In one chapter of his distinguished career, he reversed the decline of a state mired in recession. In another chapter, he salvaged the 2002 Winter Olympic Games from certain disaster. When Mitt was elected Governor of Massachusetts in 2002, the state was in severe disarray, its budget was out of balance, spending was soaring, and taxpayers were being required to pay more and more in taxes for diminishing services. The state economy was in a tailspin, with businesses cutting back on investment or even closing, and unemployment ticking up. Mitt made hard decisions that brought state spending under control. He restructured and consolidated government programs, paring back where necessary and finding efficiencies throughout. Facing a state legislature dominated by Democrats, Mitt cast more than 800 vetoes as he brought conservative principles to state government. He cut red tape for small businesses, signed into law job-creating incentives, and fought hard to bring new businesses to the state. He eliminated a $3 billion deficit without borrowing or raising taxes. By 2007, at the end of Mitt’s term, the state had accumulated a $2 billion rainy day fund in its coffers. This stringent fiscal discipline provided an essential backdrop for economic recovery. While Mitt was in office, the state unemployment rate fell from 5.6% to 4.7% and the Massachusetts economy added tens of thousands of new jobs. America faces exceptional challenges. Mitt Romney is an exceptional man with unique qualifications to lead our country through perilous times, restoring our strength at home and abroad. In 1999, the Salt Lake City Winter Olympics was on the verge of collapse. Thanks to his reputation as a superb manager, Mitt was asked to take over. The event had been bogged down in a bid-rigging scandal, sponsors were fleeing, and the budget was bleeding red ink. The attacks of September 11, 2001, just months before the start date, created a security nightmare. Some were contemplating scaling back the competition or even moving it out of the country. Mitt set to work. In a remarkably short period, he revamped the organization’s leadership, trimmed the budget, and restored public confidence. He oversaw an unprecedented security mobilization to assure the safety of the athletes and millions of international visitors, staging one of the most successful games ever held on U.S. soil. Mitt’s impressive skills did not come out of nowhere. He began his career in business. After graduating from Brigham Young University in 1971, he earned dual degrees from Harvard Law and Harvard Business School. 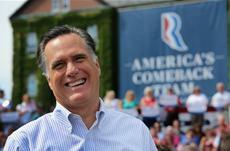 After working as a business consultant for several years, Mitt founded the investment firm Bain Capital in 1984. Under his leadership, Bain Capital helped to launch or rebuild over one hundred companies, including household names such as Staples, Bright Horizons, and The Sports Authority. As Bain Capital was growing in prominence, Mitt returned to his old consulting firm, Bain & Company, as CEO. In a time of financial turmoil at the company, he led a successful turnaround.